When I was a kid, I only ran when Big Brother chased me. I’m pretty sure that’s the only time he ran, either. But this all changed when he went to college. Wait. Get the image of fraternities, beer, and scantily clad students out of your head. Big Brother went to the United States Naval Academy, which has more in common with a prison than a typical American University. Poor Mr. Plebe would have no choice but to stagger after the track star until he puked. Then he’d run some more. And perhaps this would go on until poor Mr. Plebe either changed his major or got so fit that the cross country team had to concede defeat. Big Brother graduated from the Naval Academy with honors, a history major, and the ability to run very long distances without throwing up. He lost some of his endurance while serving on submarines, but then he met the love of his life. Big Brother’s Wife was a serious runner. I didn’t know how serious until our first Thanksgiving with her. 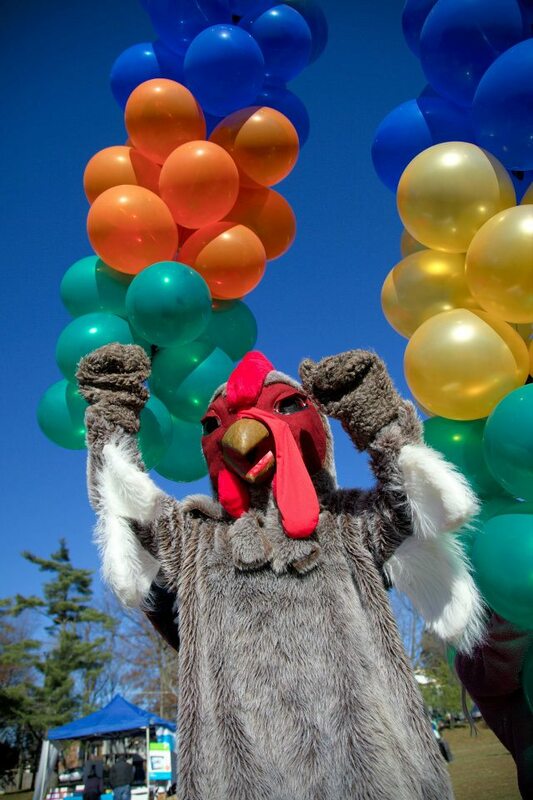 Big Brother’s wife explained that, no, decades ago, the Bethesda Rotary Club dressed a runner up in a turkey costume to raise money for charity. 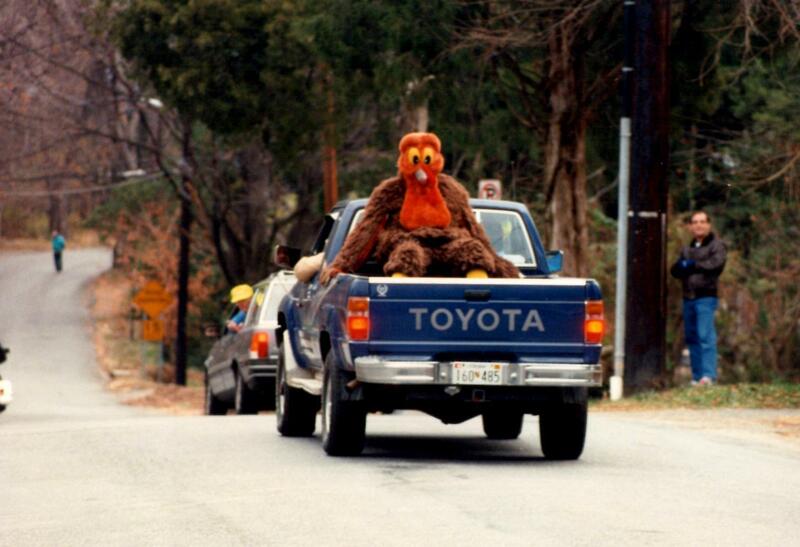 Back in the day, the Bethesda Turkey sometimes snuck a lift. Next thing I knew, I was signed up for the little known 2-mile run that started after the 10K. Which is why I was up unconscionably early on Thanksgiving that year and drove out to Bethesda after flying 3,000 miles from LA the previous day. I barely found Big Brother & Wife before the 10K started. They were soon gone. I was surrounded by parents, kids, strollers, and golden retrievers. A half-hour later, most of the kids in strollers were screaming with impatience. A costumed turkey appeared on the platform at the start line. The turkey took us through calisthenics. The stroller-bound babies, unappeased, screamed louder. The 2-mile race began. Slowly. Because everyone was walking. I was not a fast runner, but I felt like I was fighting my way through a December Saturday at Costco. With dogs. Except for the screaming babies and a few canines who were more Cujo than retriever, most people were in a good mood, at least. And it was nice to be outside in the crisp autumn air, my sneakers crunching leaves. My sneakers sliding in dog poop was less pleasant. After the race, I found Big Brother & Wife partying in a parking lot. They celebrated with several friends and several empty pitchers of Bloody Marys. All were flushed from their runner’s high (or the Bloody Marys). They compared their times. They moaned about a certain hill. They laughed about the guys who would periodically drop out of the race to break dance, then jump back in the pack and sprint ahead. I had nothing to contribute except stench. More than one runner wrinkled their nose and asked about the smell. I collected their used napkins, cleaned the dog poop off my shoes (mostly), and slunk back to my car. Next year, I vowed, would be different. I would not run with the dogs and the strollers. Next year I would chase the Bethesda Turkey for 10 kilometers. 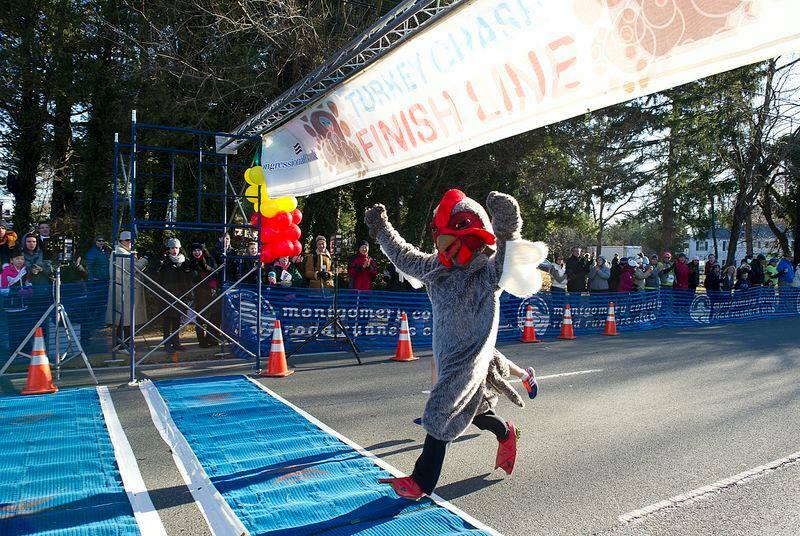 If you want to chase the turkey this year, click for their registration page. I think I’d rather be dish girl than run on Thanksgiving morning. Good luck to you! Oh, this was back when I was 27-28! Before Andy and I were even a couple. I must modify the post, lest I confuse more readers. I am relieved to know that THIS isn’t the year you are running and you have sworn off all that nonsense! I was not a runner for very long. I lack the necessary masochism, I think. I never ran. I tried to jog. Yikes! That lasted for 4 seconds. I was a great walker though. I enjoy walking so much more than I ever did running. Good call. How could you lack for masochism? Things happen to you that just don’t plague normal people. Thousand year hailstorms, REDACTED*, a litany of freak household accidents…. *Until Autumn decides if she wants to make a whole post out of intrepid car thieves in LA. Sooo…how long ago was this race?? Soo…how many years were you in medical school? Maybe that long ago. If you were a bad student. I’m pretty sure I’m at least 10 years older than you or Andy, fwiw. Isn’t your big bro a bank exec? Naval Academy guy? He is. He bailed on the Navy as soon as he served his required years, though. He was out and already had his MBA when we did this race, in fact. Some are more high-functioning than others. My older sibs especially. Yes, which is why one should always opt for the longer race. Measly two miles just won’t cut it! Yes, where does all this running craziness come from? It’s all over the world! It spread like a virus!! Is it because you can run for free instead of paying to go to the gym? I am not sporty at all, but I would do anything instead of running… I really hate running! Yes! Running is free. I mean, except for the expensive shoes, sports bras,running shorts, sunglasses, special socks, special watches, running gloves, iPhone with Strava apps, and of course the orthopedists. Aren’t you supposed to train for marathons so you won’t be exhausted? Alas for your coworker! I think marathons have been overtaken by triathlons now, actually. A street in our neighborhood was closed a few weekends ago for one! I’ve run many a turkey trot but never chased an (Olympian) turkey. Worse than running is the traffic jam, at one of the more popular turkey trots, trying to get out of the parking lot and home, one of the reasons I stopped going. Not sure how long ago your turkey chase took place but running marathons was less popular when I started running them. Now, everyone runs them! But, you know, I still like running. 🙂 My brother went through the first 3 steps of applying to West Point. His SAT scores were too low so it all ended with step 4. Clearly, Jeralyn, you needed to wait out the crowds with a pitcher of Bloody Mary’s in the parking lot! It’s a pretty good strategy, I guess. I should have known. Big Brother’s Wife is the ultimate planner. Yes, some people love running. It’s one of life’s great mysteries. Like why Andy can eat bugs or bull’s balls or sheep’s eyeballs but hates mint-chip ice-cream. Good for you. I have a couple of friends running in the 1/2 marathon here in Siem Reap – at Angkor Wat to be exact, in December. Yes, everyone’s a runner. Have you read Murakami’s running memoir? I have not! I take it I should?